Darwin 2.0 is a new release that builds upon the original seminal work, thinking which helped to establish that the authentic explanation for man's development is the scientifically grounded concept of evolution. Darwin 2.0 recognizes that evolution - the act of interacting with the environment to become better adapted - must be extended beyond the physical realm to incorporate cognitive and psychological activity. In the meantime, Darwin 2.0 represents a milestone in the use of cognitive sciences and psychology to assist in evolutionary adaptation of thinking to the emerging technologically oriented society. Priced at $499 and available at fine booksellers. How enterprising. 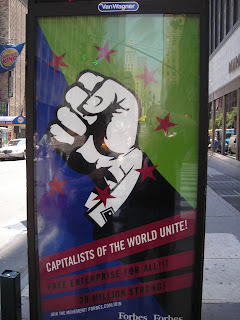 The self proclaimed champion of capitalism, Forbes has dusted of the iconic fist from Soviet era propaganda and re-purposed it. The device is itself clever support for its underlying business ideology: using it represents a very entrepreneurial act. 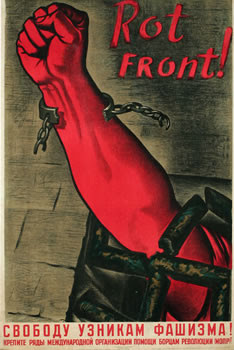 No doubt Trotsky, Lenin and Stalin are rolling around in their collective graves. Will the common man or woman on the street be confused by this creative license and think that Forbes is extolling political virtues, or worse, that the brand has abandoned its principles? Hardly. Most young people today have such a disinterest in history that they most likely aren't even aware of the satire. Most outdoor media are read for a matter of seconds and requires short, concise visual and verbal expressions of an idea to be fully digested. It's why icons and symbols can be so effective in these challenging environments. They represent potent devices because the meaning is so immediately and viscerally evident, short-circuiting normally longer processing times. Is there some 'rule of five' that decrees communications are more effective when repeated multiple times? 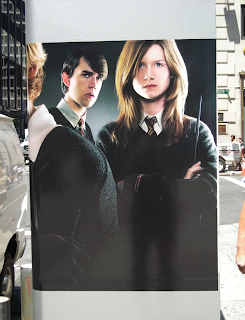 One might be mistaken for thinking so given this street vendor spotted recently on the streets of NYC. Perhaps it is no more than a left-over legacy of pre-enlightened communications theory from the 1950s. His advertising room at a premium, the space would be far better spent on increasing the point size for each food he promotes - increasing legibility for further away. It might also enable enticing adjectives to be included enhancing the appeal of his wares rather than advertising the basic items. With street vendors a commodity business in this city, it would take only modest measures to brand a seller into a more distinctive, unique provider. When a brand can dispense with its tradename and can be unmistakably recognized with its brand mark -logo - alone, it's made it into popular culture. Nike's swoosh, Target's bullseye. Apple's, well apple. 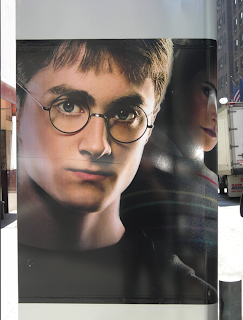 But on Lexington avenue this week on two sides of a phone booth were promotions for a popular film that carried absolutely no brand name, or brand marks or even a message other than the characters from the film. The point: if you know, you're supposed to; if not you're not. This Harry Potter is truly a cultural phenom.